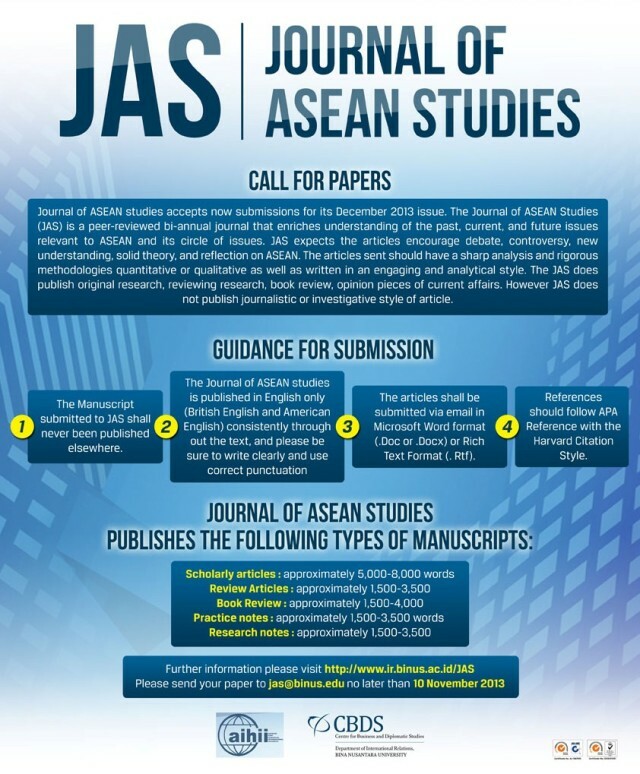 Journal of ASEAN studies accepts now submissions for its December 2013 issue. The Journal of ASEAN Studies (JAS) is a peer-reviewed bi-annual journal that enriches understanding of the past, current, and future issues relevant to ASEAN and its circle of issues. JAS expects the articles encourage debate, controversy, new understanding, solid theory, and reflection on ASEAN. The articles sent should have a sharp analysis and rigorous methodologies quantitative or qualitative as well as written in an engaging and analytical style. The JAS does publish original research, reviewing research, book review, opinion pieces of current affairs. However JAS does not publish journalistic or investigative style of article. • The Manuscript submitted to JAS shall never been published elsewhere. • The articles shall be submitted via email in Microsoft Word format (. Doc or. Docx) or Rich Text Format (. Rtf). • References should follow APA Reference with the Harvard Citation Style. • Scholarly articles: approximately 5,000-8,000 words.